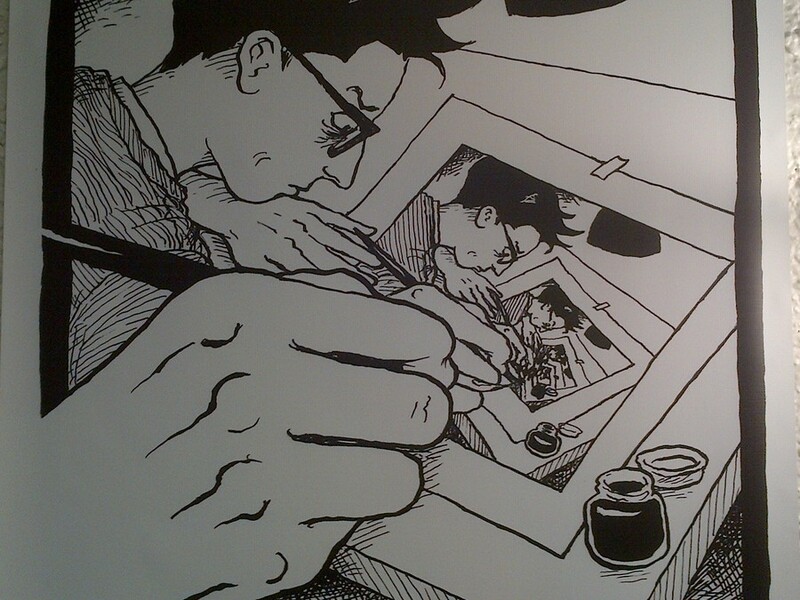 Cartoonist Alice Bechdel gets a retrospective at the Center for Gender and Race Studies. Alison Bechdel, the subject of a Center for Gender and Race Studies retrospective entitled Fevered Archives: 30 Years of Comics from the Not So Mixed Up Files of Alison Bechdel, has been a cartoonist for close to thirty years. Twenty-five of those years were spent writing and illustrating the comic strip Dykes to Watch Out For, a witty, sardonic examination of the daily lives of a group of lesbians that has proved influential in the cartoon genre. Bechdel has also published two graphic memoirs. Fun Home: A Family Tragicomic revisits Bechdel’s childhood, while the more recent Are You My Mother? is an exploration of the thorny relationship between Bechdel and her mother after Bechdel came out at age 19. Besides earning a legion of devoted fans, Bechdel’s work has received widespread recognition among the literati. Time magazine, for example, named Fun Home the best book of 2006, while publications like Slate, McSweeney’s, Granta and The New York Times Book Review have all featured her illustrations. In addition to writing, illustrating, and generally sallying forth as an unstoppable force in the comics industry, Bechdel is also one of the University's Mellon Residential Fellows for Arts Practice and Scholarship this quarter. The Center’s Fevered Archives retrospective successfully captures the intimate, almost childlike nature of her method, which pragmatically marries content, space, and organization. This journey from casual, part-time illustrator to full-time memoirist is represented cleverly along the sides of the walls leading up the staircase. The arrangement is chronological, beginning with select pieces from the seminal Dykes to Watch Out For and leading up to more focused, personal illustrations from Fun Home. These are accompanied by archival materials, like the topographical maps and newspaper clippings that Bechdel relies on for reference. The exhibit concludes with never-before-seen excerpts from Are You My Mother? While the chronology makes bold demarcations between Bechdel’s individual works, there appears to be little correlation or continuous narrative between the pieces. The curator instead selects works aimed at highlighting either specific ideas or exemplary illustrative techniques. While this does complicate the process of understanding the themes and ideas of each work as a coherent whole, it nevertheless provides a fascinating insight into Bechdel’s sources of inspiration and provokes an appreciation for her technical pizzazz. Her influences range from Sam Cooke, whose jaunty “Wonderful World” lyrics are used by Bechdel to highlight growing political pretension among the pseudo-patriotic members of the post-9/11 American public, to the English psychoanalyst Donald Winniscott, whose writings serve as the “organizing principle” for Are you My Mother? A cursory glance at Bechdel’s work makes it evident that she is a voracious reader, a habit she traces back to her father, who introduced her to the works of Fitzgerald and Proust, among others at a young age. In an interview with Hillary Chute, the Professor with whom Bechdel is teaching her Lines of Transmission class, the author was asked why she chose to write Fun Home and later, Are You My Mother? in comic rather than novel form. She said that illustration aided the process of shifting back and forth in time and perspective, giving the entire work a cinematic quality and making the transitions appear as visual realities to her readers. The illustrations themselves are sharp, emotive, and endowed with physical and emotional verisimilitude. They highlight Bechdel’s desire to use her characters and settings as vessels of communication between herself and her readers. The exhibition concludes on the third floor in what appears to be the nucleus of the exhibit, the Artist’s Salon. This condensed space, adorned with refreshingly out-of-place, retro-futuristic furnishings, contains the majority of Bechdel’s early preprofessional work. This includes handwritten notes, personal copies of books, and self-designed T-shirts for female-only organizations that she was part of while at college. “Self-Portrait” is one of the more compelling pieces out of these works, and occupies a portion of one of the room’s walls. Composed of India ink, markers, colored pencils, and “collage elements on crappy paper,” the work, divided into nine panels, charts the artist’s journey from her “self-portrait”—the environment that she constructs within her depressed subconscious—to “fantastic,” the result of her gradual and cathartic release from this depression. “Self-Portrait” is certainly the rawest and most intimate of all the works housed in the exhibit—it captures clearly and beautifully how Bechdel’s work has evolved over the course of her illustrious career.